‘Vertigo Racing’ is a perfect time killer if you like car-based racing games beyond ‘Asphalt’ and ‘Need for Speed’ series. Indie games are often hard to put into any one genre. These games bring in more variety and fun to whichever genre they are closer to. Vertigo Racing is one such game which looks like a car racing game with elements of a strategy game. Developed by Chillingo, a subsidiary of EA Sports which publishes Indie games, the game is available for free on Play Store and Apple App Store. Vertigo Racing, as the name reflects, is about driving a car in high altitude terrain. Interestingly, these hilly locations are blessed with gas stations at frequent intervals. The player is entrusted with the task to drive the car through 10 different hilly locations to win a tournament associated with each. The player has to drive a car to a certain distance to win a race. There are no car stunts but the game is not without its share of drama. The car falling over the cliff, or the gas ending a few steps away from a gas station are some of the elements which will test you regularly. The basic game tricks include slowing down where the road curves or curls and avoiding over-speeding. The player doesn’t compete against AI-based opponents or real-life online players. The on-screen controls include touch-screen buttons for accelerating and applying brakes. The gameplay is immensely challenging. The trick is to upgrade fuel efficiency, pick-up and the quality of brakes. Completing a level gets you coins, which will come in handy when upgrading. You can also get coins from the in-app store and reduce the waiting time. The basic coin pack costs ₹ 120 and the price goes up to ₹ 3,100. Though it lacks the detailing and realism of the Real Racing 3 or GT Racing 2, it doesn’t feel bland or poorly designed. For a game that takes up 100MB after installation, the game looks well-designed and animated. The various locations used within the game look very different from each other. 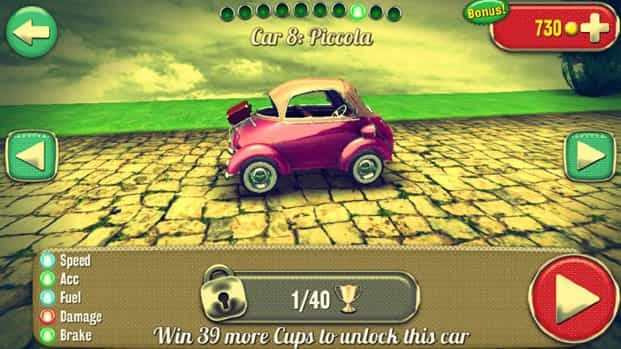 The user can also access 10 different vintage car models which will unlock automatically as you progress. The game is a perfect time killer if you like car-based racing games beyond Asphalt and Need for Speed series. It is free to play and works offline which means you can play it anywhere.